Another Tokyo area limited edition. If you like your kinako, which is toasted soy flour, you’ll be all over this one. But I’m not. Kinako coats traditional gelatinous Japanese sweets, and it’s like… well, what would you imagine having a mouthful of flour and goo is like? 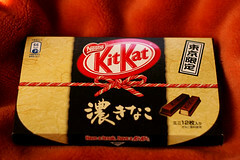 The kitkats though, have a nice nutty flavour, but are very rich. And that’s me saying that. This entry was posted in Uncategorized and tagged きっとかつ, きなこ, キットカット, チョコ, チョコレート, biscuit, chocolate, cookie, japan, kinako, kit kat, kitkat, tokyo, 日本, 東京, 濃きなこ. Bookmark the permalink.